For a lot of people around here the end of summer is a sad event. Not for me. I’m glad when we start to get a break from the heat. I also love that the end of summer means harvest time and the smell of autumn is one of my favorite smells. It’s hard to describe but it always brings back memories from my childhood. The end of summer also means apples for us here in New England. Apple season has started early here and we are very lucky to live 5 minutes away from a great farm. 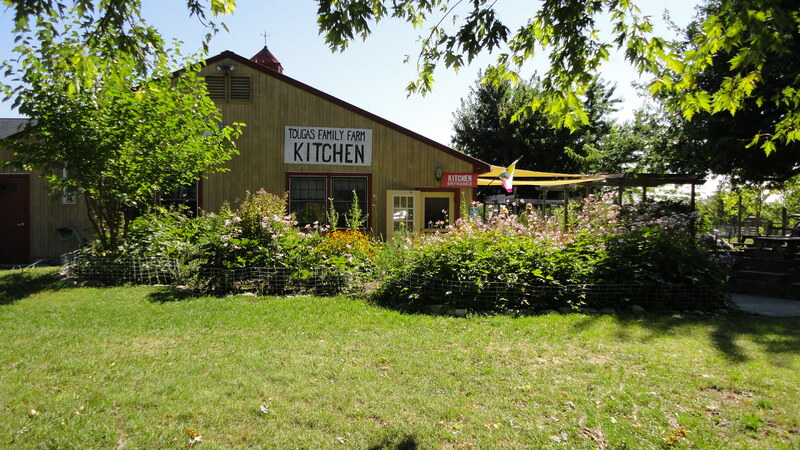 This is the not the first time I’ve told you about Tougas Family Farm and it probably won’t be the last. This past Saturday I took the kids to the farm to stock up on apples. My daughter eats an apple every day in her lunch at school and another one when she gets home. We go through a lot of apples here. We ended up getting Ginger Gold, Honey Crisp and Gala apples. My daughter’s favorite was the Ginger Gold. The bag they provided to us listed all the different varieties, when they are available and rated them by taste and use. All the ones we got were rated excellent for pie. I took that as a sign that I needed to make a pie. My apple pie is simple and apple pie is something that you shouldn’t mess around with once you’ve perfected it. Preheat oven to 375 degrees. 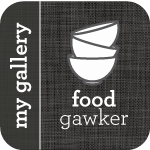 Make the pie crust using the same method as on my Tomato Tart. Pat the dough into 2 almost equal balls. Roll out the larger of the two balls and use it to line a 9-inch pie plate. Set aside the plate and the other dough ball while you prepare the filling. 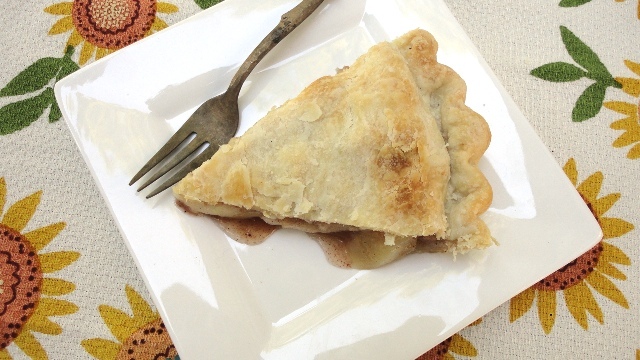 I used the Honey Crisp apples for this recipe. One of my favorite things for my Mom to bake was apple pie. Not because it was my favorite thing to eat but because it was fascinating to me how she peeled the apples so the peel was one continuous peel. I loved eating the peels while she made the pie. 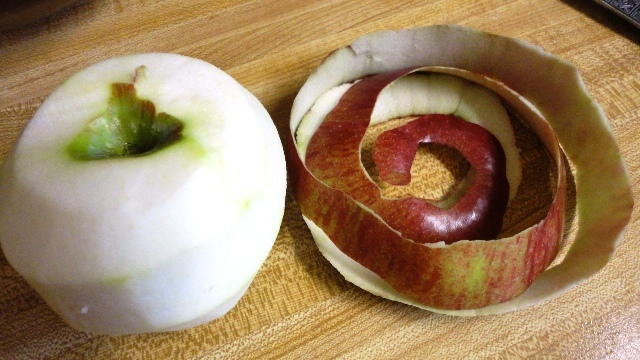 It’s my goal each time I peel an apple to do the same thing. My kids will sometimes eat the peels too. In a large mixing bowl combine the sugar, flour, cinnamon and nutmeg. Add the apple slices and gently toss until coated. 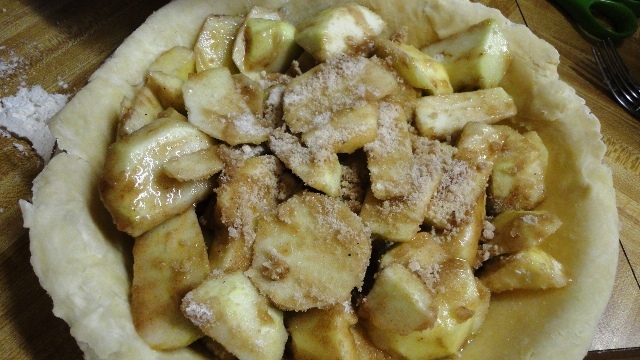 Transfer the apple mixture to the pastry-lined pie plate. Trim pastry to the edge of pie plate. Roll out second dough ball and use it to cover the apples. Fold over the double-edge of the pastry and crimp as desired. This was another thing that fascinated me about making pies. I love how two fingers pressing into the dough in just the right way makes such a beautiful crimped crust. When I was a kid I thought that was just magical. You could also press together with a fork. Prick the top of the pastry with a fork to allow the hot steam to escape while the pie bakes. I always use a pie shield to protect the crust from over-browning. If you don’t have one you can use a 12-inch square of foil with a 7-inch hole cut out of the center. 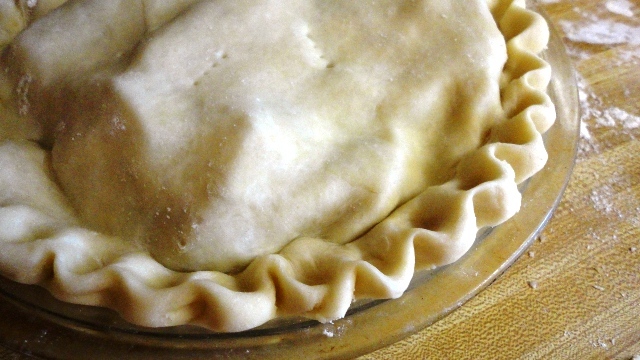 Loosely mold the foil over the pie’s edges. Bake for 25 minutes at 375 degrees. Remove foil. Bake for 25 to 30 minutes more or until top is golden. Cool on wire rack. My kids have yet to try this but my husband has been eating it every night after dinner. It’s not something new for him but that’s okay. I wouldn’t want to mess with this apple pie perfection. I don’t yet have a “go-to” apple pie recipe, so I’ll have to try this one out and see if this is it! Looks great! Beautiful pie. I’ve always been smitten by a crimped pie crust too. : ) The apples though… I complain every fall to my mom about how much I despise peeling apples. Maybe I need to have some fun w/ it next time and try to get it all off in one spiral! 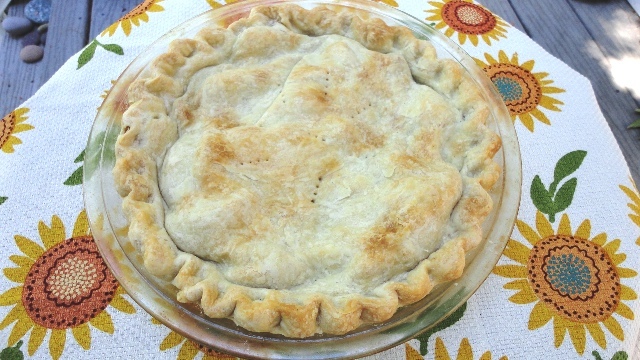 I used to make Apple Pie from a 1968 Better Homes and Gardens Cookbook. It was kind of tradition growing up to have it on Sunday night after dinner. I don’t EVER remember the recipe having brown sugar in it !! The pie always came our perfect, and the last thing before putting on the top crust, was to dot it with butter.